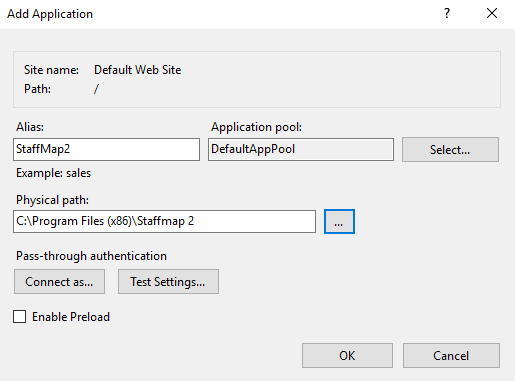 When StaffMap is installed, the setup wizard automatically creates an IIS application named 'StaffMap2'. There may be cases, however, where the setup wizard is unable to create the IIS application. This may be due to permissions settings or could also happen if the 'Default Web Site' has been renamed or deleted. These instructions assume that StaffMap was installed to the default installation folder (C:\Program Files\StaffMap 2). IIS Applications are called Virtual Directories or Virtual Applications in other versions of IIS. 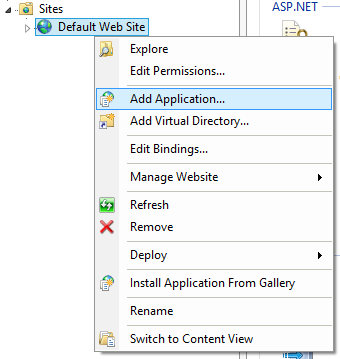 If given a choice, choose Virtual Application or IIS Application. Select Start > Control Panel > System and Security > Administrative Tools > Internet Information Services (IIS) Manager. Expand the left pane until you see Default Web Site. Right click Default Web Site and select Add Application. For Physical Path browse to the folder that StaffMap was installed to (C:\Program Files\StaffMap 2). For Application Pool ensure that DefaultAppPool is selected. Check under Default Web Site that the IIS Application was made.